Lynn Blair has been with the Abilene Pipers since 2005. He has played in parades, funerals and special events. Lynn is a graduate of McMurry University. Lynn recently taught and studied at the University of Idaho in Pocatello. Pocatello is the largest city in Bannock County Idaho. A bannock is a Scottish oat cake. 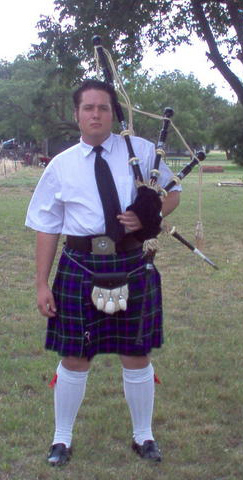 Lynn says this was the primary reason he chose to move there.sLynn is also a Change Ringer.by some of the world's greatest pipers on movies and on TV, along with his strong Scottish family background, but it wasn't until he watched Eric Rigler pipe at Ronald Reagan's funeral that he decided to play. He has performed for local funerals, parades, school sanctioned events, Abilene Art Walk and the 2005 De Leon Peach and Melon Festival.